You may be sensing a theme here with the honey recipes. So I will let you in on the fun. But first, do you like watching cooking competitions? Like Iron Chef and Chopped? I do. Watching gifted cooks and bakers compete to create the most original, most delicious, most beautiful dish is inspiring!—and also makes me realize that I am very small and very feeble in comparison. Watching cooking competitions makes me realized I am a good cook, but not a great cook. So lately, Dave and I have taken to pausing these shows right after the mystery ingredient is revealed to discuss what we would do if presented with that challenge. It’s an exercise in creativity! What could I actually dream up? What could I put together without the help of a recipe or Google? When my sister-in-law suggested organizing a tasting party for friends and family based loosely on the cooking competitions I know and love, I thought it was a fabulous idea. Enter honey! The mystery ingredient for our Very Valentine’s Mystery Ingredient party. I am still learning to like the flavor of honey, but I was excited to use this ingredient in baking because honey is so much healthier than refined sugar. 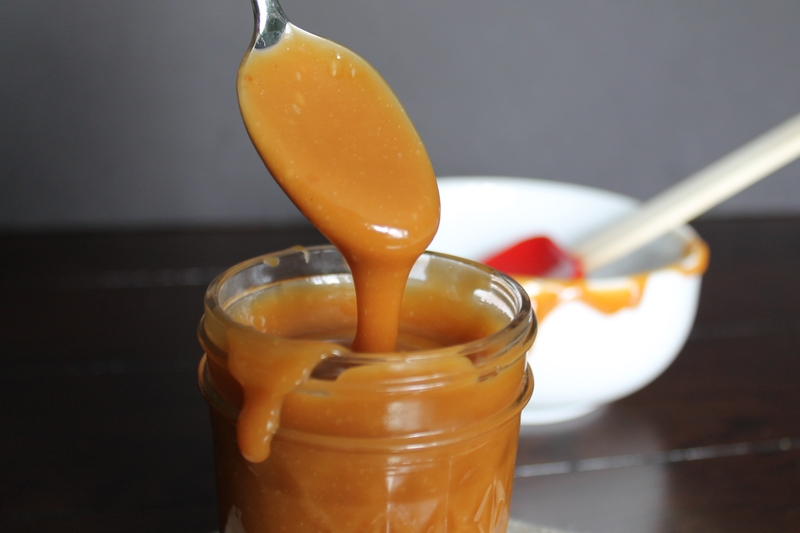 And when I started pondering what I would like to do with honey, one of the first things I thought of was making a delicious, salted caramel sauce using honey instead of sugar! Holy moly. Was it ever good! Okay, look. I am sharing this recipe with you because it’s so amazing, I literally ate the entire first batch with a spoon. Couldn’t stop myself. 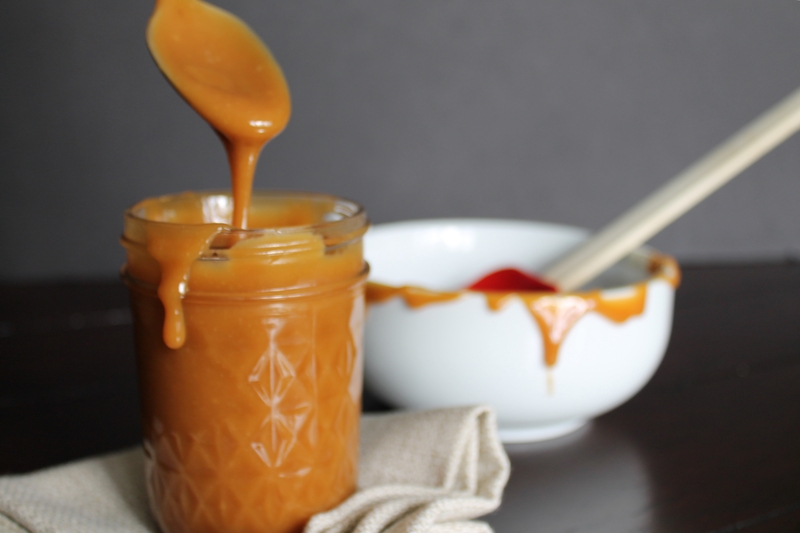 But you should probably know that this recipe produces a caramel sauce that cools into a sticky solid (like caramel candies!). 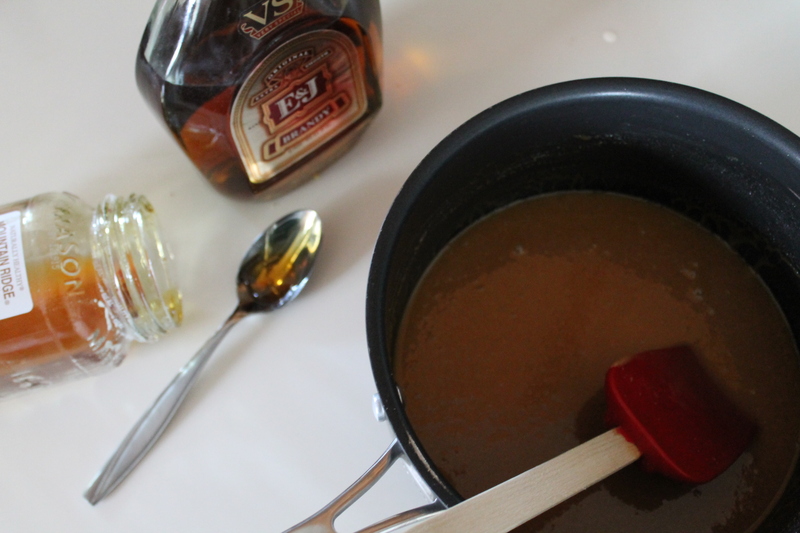 Don’t worry–that’s what almost all caramel sauces do. It’s normal. Heat it up in the microwave for a few seconds and it makes a deliciously runny ice cream (or pancake!) topping. Unfortunately, I needed a sauce that was liquid at room temperature for my final honey dessert, so this sauce didn’t make the cut for the party. I just thought you should have it. 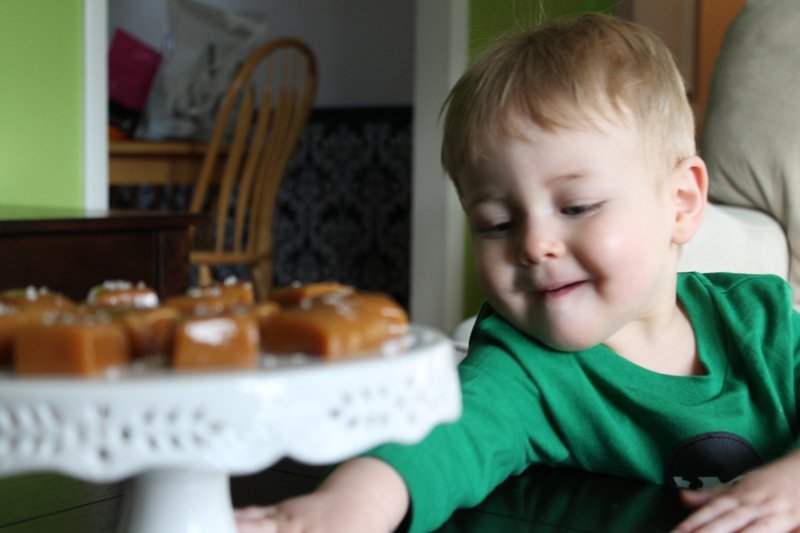 Because it is possibly the most delicious caramel I have ever tasted. Now, bring your cream to a simmer! Add in the honey and brown sugar. I use raw honey, partly because it’s healthier (well, until you cook it, I suppose), and partly because it has a stronger flavor. Hey, if you’re going to make a honey dessert, it should at least hint at honey, right? Cook, stirring constantly but not frantically, until the sauce thickens. You don’t need a candy thermometer here. You are looking for big, sticky bubbles. 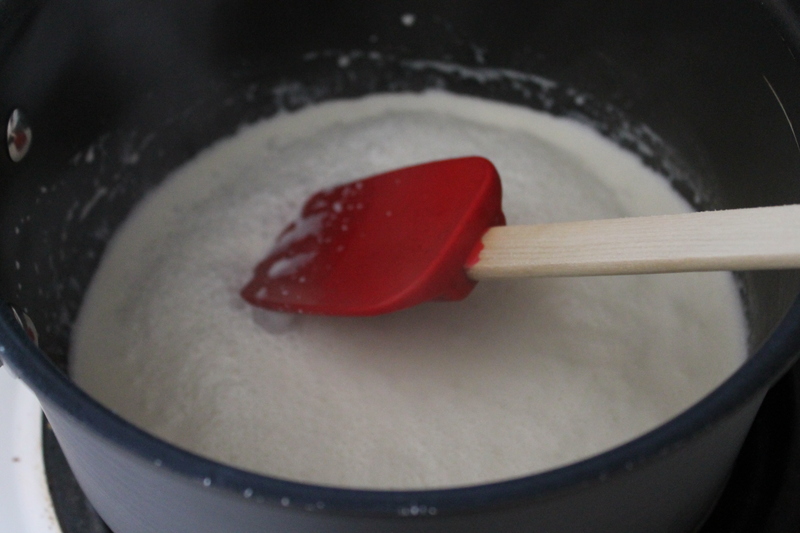 You will be able to tell you’ve got the right consistency when stirring begins to look more like pulling the sauce through itself than like sloshing the sauce around. Did that make sense? It will start to look like runny candy, and it will begin to smell like cooking sugar. The color is hard to judge, as both honey and brown sugar are already brown, but the mixture will also turn a few shades darker. Honestly, there is a bit of room for error here. So don’t panic. 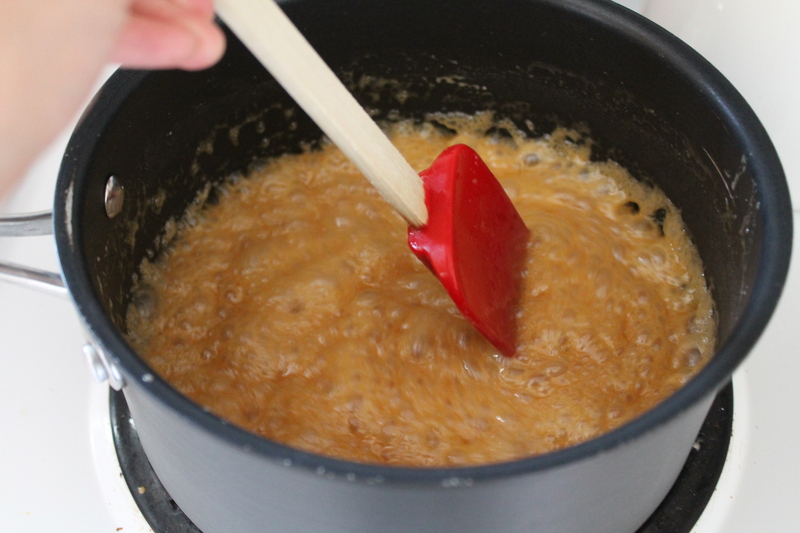 When the sauce is thickened and caramelized, remove it from the heat. Immediately stir in the salt, butter, vanilla, and brandy. 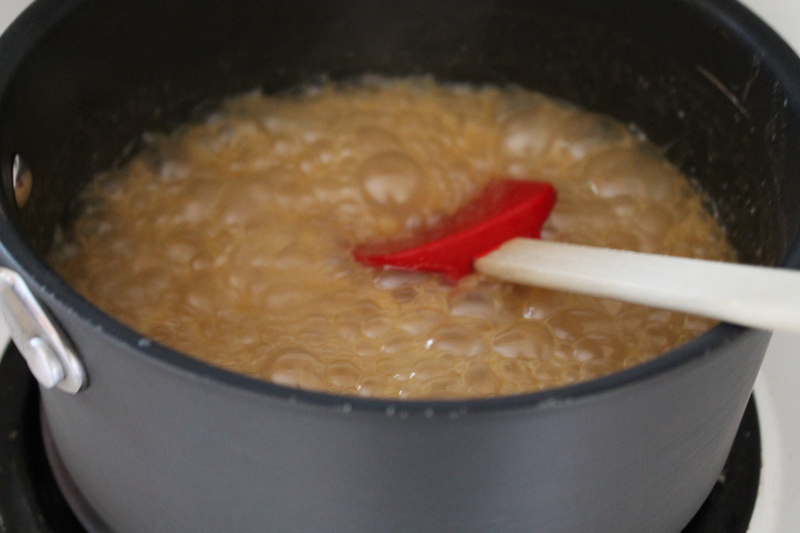 The sauce will bubble up a bit with the addition of the liquids, but keep stirring until it smooths out. Also, you may want to stand back a little, or else get hit in the face with a blast of pungent steam as the alcohol cooks off the brandy. Ta-daa! Delicious caramel sauce. It will thicken tremendously as it cools. Store it in the fridge, then when you are ready to drizzle it on your ice cream or french toast or cheesecake (or apple slices? I hear people like that…), just pop it in the microwave for 10 seconds and it will become silky and runny again! Or, better idea. Pour it onto a small sheet of lightly oiled foil and let it cool on the counter. Sprinkle a bit of extra salt on top (I know we already added a good bit of salt, but I find that sea salt really balances to super sweetness of the honey, and a little extra just makes the flavor more complex) and then you have honey caramels! Chewy and amazing. Try not to let your toddler eat them all. That would be a pint-size disaster. Bring the cream to a simmer. Stir in the brown sugar and honey. Cook, stirring slowly, about 5 minutes, or until the sauce thickens and begins to darken. Remove from heat and stir in remaining ingredients. When the sauce stops bubbling, pour it into a heat-safe glass container. Let the sauce cool completely on the counter, then store in the fridge. Before serving, warm the sauce in the microwave until thin and spoonable, about 30 seconds. Yeah, our original goal was to actually DO all of the challenges with the contestants (or at least go do them after watching the show). But alas…that lasted for exactly one show. But those were some dang good chocolate eclairs!